The Lisbon Portfolio, The story of photographer, Henry White, is now available as a 472 page, 5.5 inch by 8.5 inch printed book from CreateSpace. To get a copy right now click here. In about a week the book will be in stock on Amazon.com in addition to CreateSpace. If you'd prefer the Kindle version, click here. I was first alerted to the arrival of the UPS truck by Studio Dog. She leapt from the couch where she had been getting the space behind her ears scratched and raced to the front door either barking out an alarm or, maybe expressing unfettered joy perhaps because she knew what the man in the brown uniform might be delivering. I brought the box into the kitchen (all important boxes seem to get opened in the kitchen) and sliced it open. 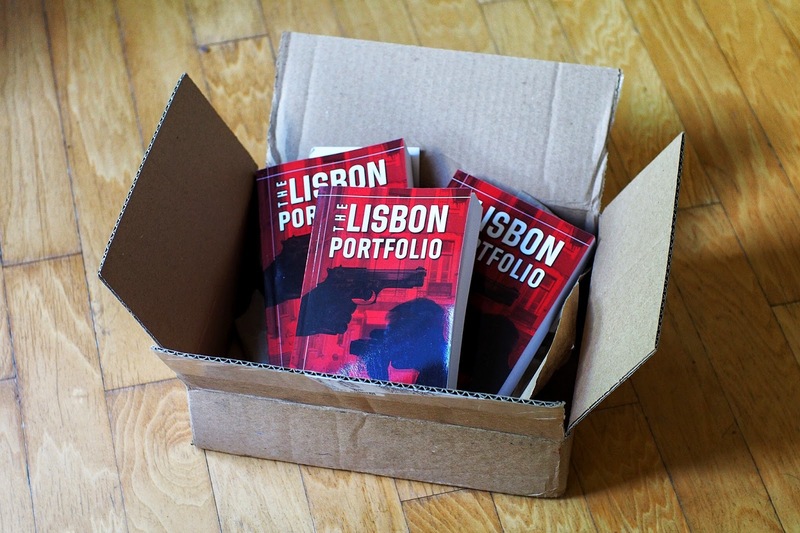 Inside were the three proof copies I'd ordered of the novel, The Lisbon Portfolio. Belinda insisted on proof copies as she wanted to make sure that the cover printed exactly as she designed it. When she got home from her real job as a professional print graphic designer she gave the book a thorough exam and declared it fit for consumption. Frankly I am shocked at how elated I am to see the book in actual print form and to hold it in my hands and turn the pages. I guess it's because I grew up reading real, paper books with the fervor of a true addict. Something about having a print version makes it so real for me. You've got to consider that I've worked on the story for so long and in an electronic format one's reality is comprised of one visible, tangible page at a time. With the printed copy I could feel the weight and promise of all the pages in my hands. I abandoned everything else I had scheduled last night and crawled into my favorite chair to see how the book reads. As a book, book. I was intrigued to find that the story seemed so new to me, so exciting. I stayed up late and read my favorite parts. The part with the weaponized Leica. The chapter with the bloody restroom. The mysterious woman in the glowing shaft of light. Every passage, translated onto paper seemed almost new to me. I loved the experience. We are producing the book at CreateSpace. It's Amazon's print on demand company. You will be able to source the book from CreateSpace at the first link above, right now. In about 4 days the book should (almost) magically appear on the regular Amazon.com site, right along with the list of other books I've written. When that launch happens I will announce a link there as well. Finally, CreateSpace distributes books to most major distributors so there's a good chance that you can order a copy through your own favorite bookseller if you'd like. Fulfillment should be pretty quick. After reviewing the book I ordered a case of 12 copies to give out to reviewers and my favorite bloggers. I am thrilled with the way the electronic copies of the book are selling and I'm hoping that our readers really come to like the character, Henry White. I'm already hard at work on the sequel. Before you conquer Everest write the screenplay. Or maybe the Everest trip is research for the sequel. It includes your commercial photography book which i have been digesting! Now we're talking. I don't seem to get on well with e-books but the real deal in ink and paper? Oh yes. The bloody restroom scene is so good. All of your scenes with the Leica are fantastic, including the final one. I admit that I felt compelled to get an old Leica after reading your book. I felt the nostalgia even if I was never truly a film shooter. Looking forward to the paper book. ODL, How do you like the commercial book? I think it's my best non-fiction book so far. Curious what less prejudiced people have to say. It is a very informative book. For a bit of context i own a design firm, and having studied some photography got involved in product work over the years. As it stands today i am actually very good at the genre but having never worked with a photographer need to better understand how to match my skill and ability with my pricing and methods. As my agency is now 6 designers strong i dont have the time to apprentice or go back to school (I also have 2 small boys taking up my time) I got your book to try to get a better grasp on what i shoukd be doing, how i should be thinking of this work commercially. Your easy style of writing make absorbing the information quite easy and entertaining. A perfect example is your Day rate vs Fee Based work section where you break down the advantages of fee based over day based, or where you break down costs to consider. In general it is an easy read (well written) and friendly in tone, which makes absorbing your perspective much easier. A book i would recommend in a heartbeat. Thanks Abraham, I appreciate that you took the time to let me know. Best luck with your business! First, congratulations on the book. I'm a thriller author and serious amateur photographer. While most of my book sales are digital, you're right: there's nothing like holding it in actual print. I just bought the Kindle version of your book and will dive into it tonight.